Abstract: In the field of operational water management, Model Predictive Control (MPC) has gained popularity owing to its versatility and flexibility. The MPC controller, which takes predictions, time delay and uncertainties into account, can be designed for multi-objective management problems and for large-scale systems. Nonetheless, a critical obstacle, which needs to be overcome in MPC, is the large computational burden when a large-scale system is considered or a long prediction horizon is involved. In order to solve this problem, we use an adaptive prediction accuracy (APA) approach that can reduce the computational burden almost by half. 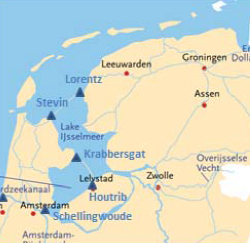 The proposed MPC scheme with this scheme is tested on the northern Dutch water system, which comprises Lake IJssel, Lake Marker, the River IJssel and the North Sea Canal. The simulation results show that by using the MPC-APA scheme, the computational time can be reduced to a large extent and a flood protection problem over longer prediction horizons can be well solved. Reference: X. Tian, R.R. Negenborn, P.J. van Overloop, E. Mostert. Model predictive control for water management using adaptive prediction accuracy. In Proceedings of the 11th International Conference on Hydroinformatics (HIC 2014), New York, USA, August 2014. Paper 1183.